Collabspot Connect completely integrates Sugar with Gmail, allowing for complete CRM adoption and a 360-degree view of your team’s customer and prospect communication. We all spend more and more time in our email to run our business. 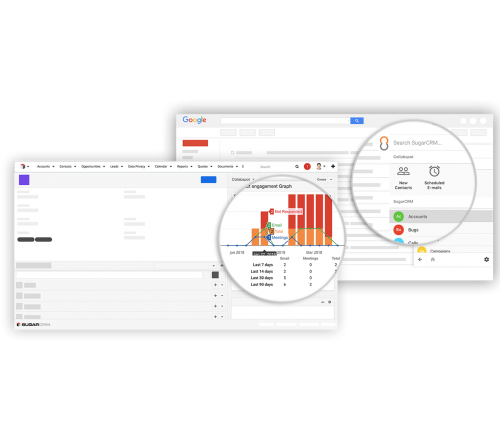 Collabspot is the only Chrome Extension that provides Gmail users with one-click access to customer, partner, supplier and employee data from related business applications. Let your sales reps access Sugar from where they work the most, and watch as they finally start to use your CRM. Archive emails to Sugar, edit any Sugar record from inside Gmail and automatically sync your calendar and contacts so your data in Sugar will always be up to date. Gain complete visibility into the health of each account, contact, lead, or opportunity so you can prospect, forecast, coach, and manage your pipeline more efficiently.